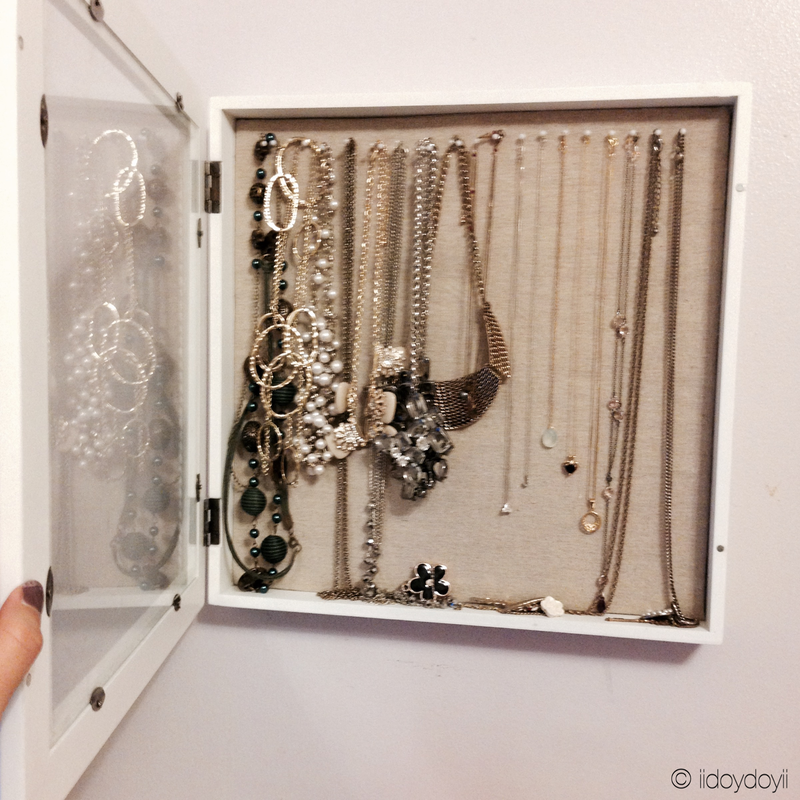 I used to store my necklaces all over the place… in a jewelry box, hanging off a jewelry holder, etc. I never knew what jewelry, or I should say necklaces, I had because I never got to see them all at once. I got the idea to make my own necklace holder and was ready to think of how to do the DIY project. 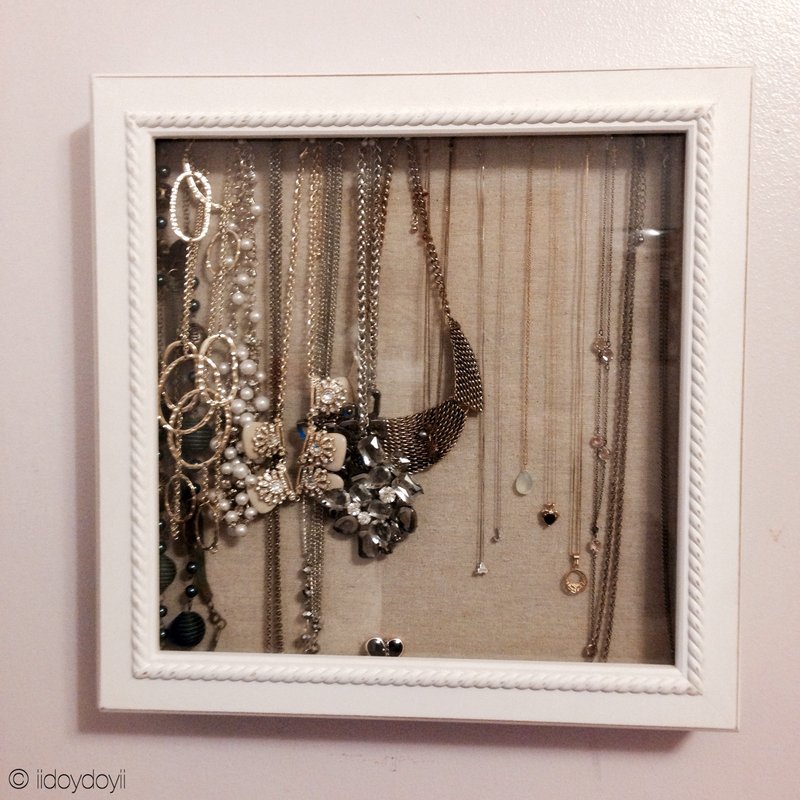 Luckily, I was shopping at TJ Maxx and stumbled upon this shadow box; it was perfect. The price was right. I didn’t have to do my DIY project anymore because it was worth it to just purchase this. I loved the way it looked and imagined how it would look in my room. It came with its own pins, about 20 or so. They were long pins with a white bead at the end that resembles a pearl A.K.A. long white pearlized pins. The shadow box seemed to have a cork board material behind the soft cloth-like material shown. I understand that shadow boxes have several ways to be used. One of these ways is a military shadow box where a family receives their relative’s belongings, including awards and medals in their military career. I have also seen others use shadow boxes to display a common theme in the box, such as collections of various objects. In addition, one of the most common ways to use a shadow box is to hang up pictures of family and friends. I just thought this was the most useful way for me to use this shadow box. I am all about something that keeps me organized while being pretty to look at, and all of my necklaces are stored here. It opens with ease. With heavier statement necklaces, I have had no problems with just doubling up the pins. There is room at the bottom on the ledge of the box for the longer necklaces which is convenient. I get to see all my necklaces laid out, and it makes it quick and fun to pick the one I want to wear that day. Also, seeing the different lengths of similar looking necklaces allows me to properly layer necklaces, something that I would have never thought to do before I had the shadow box. Unfortunately, there will be no link today. I can say that this item was purchased at TJ Maxx for around $16.99-$17.99. What a great way to display your necklaces! Love this DIY! Thank you for stopping by! The necklaces are even prettier to look at now. Such a clever idea! And I feel like this could be DIY’d! Thank you! It definitely could be a DIY project. I would have done it with those picture frame boards instead if I did a DIY. I’m glad I found this alternative. Yes! It does take a day to just organize things in your room. It was so easy for me to just pick out a necklace to go with my outfit, especially when I’m in a hurry. Ain’t bad to look at either! Thank you for nominating me, Cylia! I can’t wait to do the tag. How did you find my blog? If you don’t mind me asking 🙂 Btw, I followed you on Bloglovin. What a great idea! I could really need something similar myself, mine just lays around all over the place. Thank you! I was the same way, except they were hidden in boxes/drawers, so I never saw my collection as a whole. I think as long as they’re in the same place, you’re good to go. I have asked my local Jewelry Store for advice, friends, and family on clever ways of storing my jewelry. This is absolutely clever. Nicely done! I’ve always wanted to do something like this. Now that I’ve seen how yours turned out.. I REALLY need to do it! 🙂 I followed your blog and can’t wait to see what you post in the future! I would love if you would follow my blog https://blogatsoshesays.wordpress.com/ as well! Let me know if you end up doing it. It makes great eye candy in your room! Just followed also 🙂 I saw that you changed/switched your blog over? What a great way to store necklaces. I’ve always just kept them in little compartments in my wardrobe and though it’s good, I do have quite a few necklaces and they can get pretty tangles. Annoying! Thank you 🙂 Same. I would just keep it in a dark little jewelry box and not know what I really have! Thank you! Most people use it for pictures or memory boxes! This is so pretty! How lucky that you found a ready-made one at TJ Maxx. Love that place. Don’t even get me started! That place has gems, you just have to be in the mood to search for them! Absolutely! I grew up on the TJ Maxx stores, LOL. Mom trained me well.